The Gourmia GFD1650 is a typical large dehydrator that is one of those all-around trustworthy products that few can find fault with. It comes with convenient features, looks great, is not too pricey, and has hundreds of recommendations. At the same time, the machine has no features that really help it stand out among other options. In other words, this dehydrator is a safe bet, which is probably a good place to start for serious newcomers to the dehydrating universe. Reviews of the Gourmia GFD1650 are highly complimentary for the most part. They praise the even drying of the machine and the excellent taste of fruits and veggies after dehydration. There are many positive reviews for each of the main components of the machine. These include the accuracy of the heating, the convenience of the digital apparatus (notably the preset temperature settings and built-in timer), and most of all, the very quiet sound it makes. The few critical reviews cite its huge size as an issue. This could be problematic for you if you are working with a limited countertop area. Other reviews mention that it takes this dehydrator longer to heat up certain foods compared with other dehydrators of the same size. On that note, certain foods can easily take up 20+ hours to dehydrate, which is more than the built-in timer can manage in one go. On the plus side, the negative and positive reviews all tend to agree that Gourmia has top of the line customer service. At the end of the day, a high ranking of 4.6 out of 5 in nearly 400 Amazon customer reviews is hard for most products to beat, not to mention other dehydrators. What Does the Gourmia GFD1650 Come With? 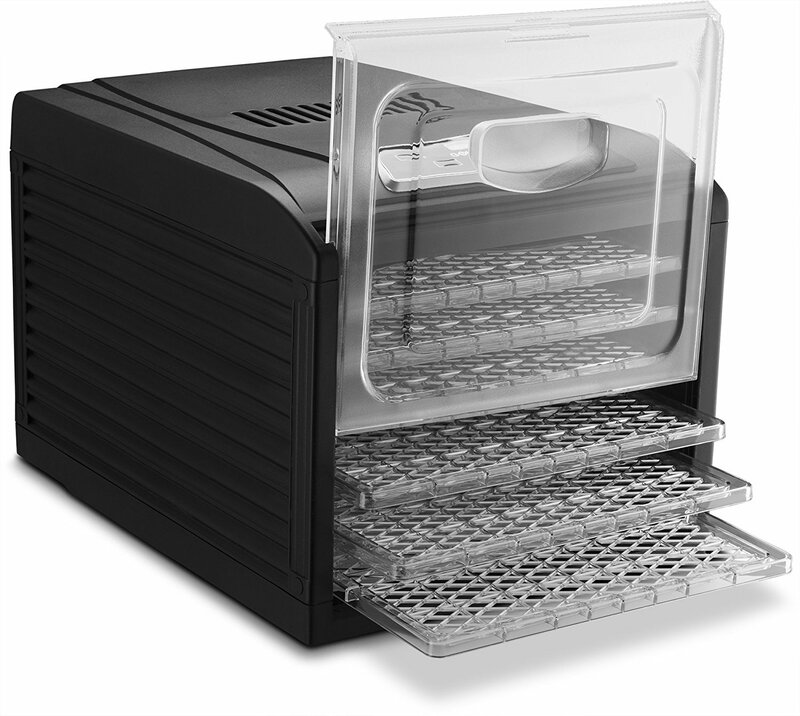 The six wide and height-adjustable shelves enable you to prepare more food of varying sizes than most other dehydrators in the same price range. More space means more food, which ultimately means less work. Really emphasizing space efficiency, this dehydrator also boasts a larger nine-shelf model. The drawback of these roomy shelves is that they are not safe to stick in the dishwasher. A digital heating system makes dehydrating with this machine simple and convenient. The thermostat can specify drying temperature from 95º F to 158º F for precision cooking, and the built-in timer lets you set reminders at 30-minute increments for basically a whole day’s time. Speaking of convenience, the dehydrator comes with a transparent window that serves as the machine’s door. Having a clear sight to the food as it dehydrates enables you to gauge progress throughout the entire process. This setup is ideal for meticulous people who enjoy monitoring their work and perfecting their dehydrated food to a T.
As a bonus, the company provides a dehydrating cookbook along with the device as a way to encourage customers to try their various recipes and put the dehydrator to the test. Finally, this Gourmia product is ETL certified, which is a proof of product compliance to North American device standards. Add to that a one-year warranty, and you can rest assured that the dehydrator is a high quality appliance. A potential downside with this dehydrator, particularly for jerky lovers, is the relatively low amount of drying power this machine has to offer. 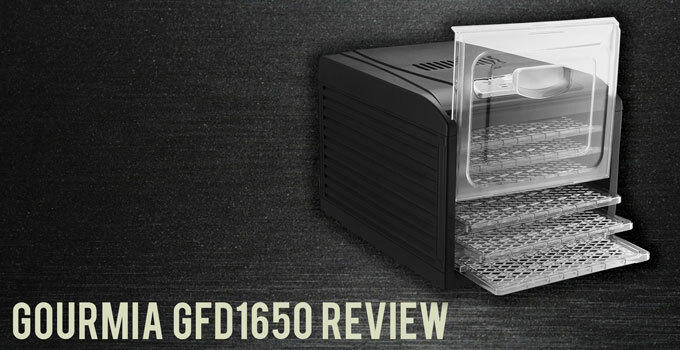 Supplying a limited 400 watts of power, the Gourmia GFD1650 offers slightly less maximum heat capacity than all but one other dehydrator featured by Upland Hunter. And yet, the dehydrator gets the job done pretty well, all things considered. The reason behind its success might be the Circus Mart 360 degrees Air Flow Circulation technology it wields. This is said to dry food evenly inside its spacious interior with nothing more than a gentle whirring to make one notice. The airflow seems to be so good that the amount of time required to complete a dehydrating cycle more or less mirrors the time it takes for other machines. The higher wattage of other machines should theoretically dry the same type and amount of food faster than this one. Whether or not this is true in practice is still up for debate. How Large is the Gourmia GFD1650? Larger than other dehydrators that share its wattage, the Gourmia GFD1650 is hefty, but not too big to fit on a countertop. The entire machine has dimensions of 19.4 by 15.4 by 14.6 inches and weighs 16.4 pounds. Individual drying shelves are 13 inches long and 12 inches wide. In total, the drying shelves encompass 6.5 square feet of drying space, with the capacity to support up to a whole pound of food on each shelf. The nine-tray version of the dehydrator includes a few more drying trays. It is also tall enough to allow users to comfortably dehydrate different types of food without worrying about excessive mixing of aromas or flavors. This trait is critical for maintaining the authentic taste of food, which is why the larger model comes at an added 50% cost. The fan in this dehydrator sits at the top of the machine and makes a gentle whirring that can be heard from most places within the same room as a soft sound that is rarely said to be distracting. If anything, the sound is comparable to white noise that you grow accustomed to after a few minutes. The design of the dehydrator is simple, mostly black in color, and inconspicuous. It resembles a desktop printer from a distance. One of the drawbacks, however, is its short power cord. You will most likely need to use an extension cord with the machine, unless you have an outlet available near the place you will set it during use. The Gourmia GFD1650 premium countertop dehydrator is a solid option going at a mid-range price. It can dehydrate a wide range of foods including meat, fish, poultry, fruits, vegetables, herbs and spices, and nuts. Little can be said to denigrate the machine. Though it in no way outshines most of its fellow highly rated competitors, there is almost nothing to complain or worry about. A driving factor for why the rating is a 7.5 and not an 8 is its low maximum wattage, which for many aficionados of meat (gamey foods, to be more precise), a high power threshold may tip the scale in favor of other dehydrators instead.